DJ Sakin is back after a string of successful releases this year on the perfect label to match his uplifting style - Para X's superb Intense Emotions imprint. Desert Rose starts with intent and bags of drive. Beautifully produced as you would expect from a producer of this pedigree and with a breakdown that simply oozes emotion and euphoria. Label and artist in perfect harmony. This is simply huge!!! 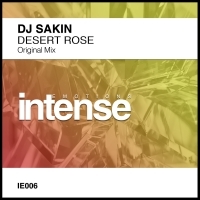 'Desert Rose' is available now from Beatport and iTunes.